Chasing a seemingly elusive dream may seem impractical to the most logical people during the most reasonable of circumstances. But those goals become more feasible during arduous times, as seen with the new action sequel, ‘Beyond Skyline.’ The successor to the 2010 adventure movie, ‘Skyline,’ marks the feature film directorial debut of Liam O’Donnell, who also wrote the scripts for both installments. The scribe overcame challenging obstacles to achieve his goal of helming a feature, just like the protagonist in the adventure follow-up diligently worked to save, and repair his troubled relationship with, his son during the alien invasion that began during the original film. 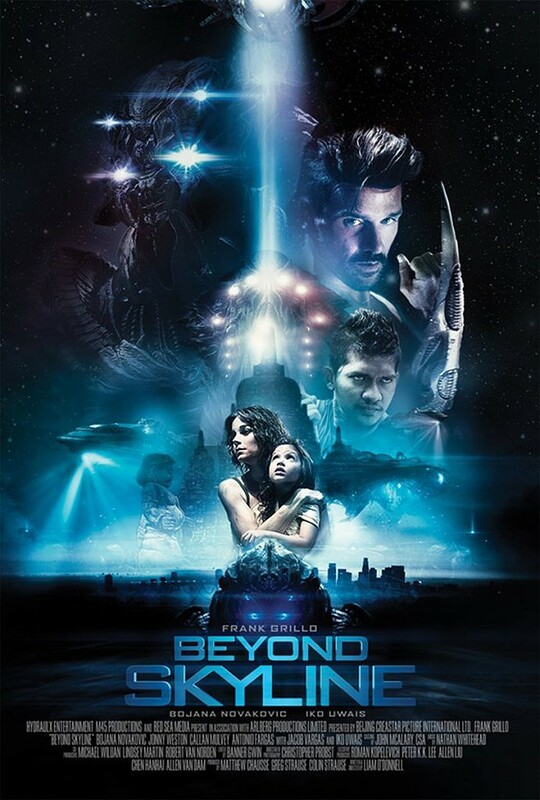 ‘Beyond Skyline,’ whose events run concurrently with its predecessor, follows Detective Mark Corley (Frank Grillo), who’s still grieving the loss of his wife. He has become estranged from his son, Trent (Jonny Weston), who’s also still struggling over learning how to cope with the death of his mother. The invading alien race is still descending upon the Earth, and leaving destruction in its path. When most of the population of Los Angeles is taken hostage by the tumultuous occupying aliens, Mark decides to force his way onto the ship in order to save his son. But after the ship subsequently crashes in Southeast Asia, the detective must forge an alliance with a band of survivors there, including Sua (Iko Uwais). Together, the new allied humans must discover the key to not only saving Trent and his fellow hostages, but also how to take back their planet, once and for all. O’Donnell generously took the time recently to talk about writing and directing ‘Beyond Skyline’ during an exclusive interview over the phone. Among other things, the helmer discussed how making his feature film directorial debut on the horror sequel was an incredible experience, in part because the producers had faith in his creative approach, and he was able to cast the actors who he had envisioned playing the roles while he was working on the script. The filmmaker also expressed his gratitude over the drama being accepted to play at this year’s Toronto After Dark, as the festival team not only supported the movie, but fans also embraced the sci-fi franchise’s second installment, as well. The conversation began with O’Donnell explaining why he decided to write the screenplay for the new sequel, after he co-scribed the the script for the original film, and how he came up up with the idea for the second installment. “Well, we kept rewriting the first film in post (production), so the ending kept getting bigger and bigger on the ship. That became really fascinating to me, as well as to Greg and Colin (Strause), who were the directors of the first movie, and the producers of this film. We thought it would be a really interesting world to further explore,” the writer-director revealed. “So with this movie, I wanted to spend more time on the ship, and really show the aliens, and the fact that it’s a house of horrors up there,” O’Donnell explained. “But I felt right away, even back then, that (this new film) needed to start with a new in, due to how few survivors there were at the end of the first movie.